In 1940, alfalfa-seed farmers in the desert of central Utah made an interesting discovery: The primary pollinator of their crop was not the honeybee, but the alkali bees that nested in the region’s salt flats. For all its status as the workhorse of American agriculture, the European honeybee didn’t really like foraging in alfalfa. But alkali bees loved it, pollinating some 5,500 flowers daily. Farmers lucky enough to live next to them were raising three times more alfalfa seed per acre than those who didn’t. From Utah to Washington state, farmers started transplanting thousands of cubic feet of soil with alkali bee nests to aid in the production of alfalfa seed — a hugely important crop because the alfalfa grown in hayfields produces almost no seed on its own. 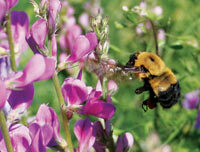 The largest managed alkali bee nesting bed is now five acres in size and is home to more than 5 million bees. “It gives me conniptions, it’s so big,” says Jim Cane, an entomologist at the U.S. Department of Agriculture Bee Biology and Systematics Laboratory in Logan, Utah. “It’s just roaring with bees. The ground is shimmering for several acres.” Cane says these farmers harvest at least 20 percent more seed than needed to break even. 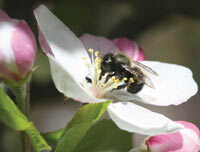 The humble alkali bee had turned the attention of a whole sector of commercial farmers away from the European honeybee. It was the first time this had happened. It would not be the last. While honeybees spent thousands of years honestly earning their place in our hearts with their honey production, easily manipulated colonies, generalist pollinating tendencies and heroic work ethic, their wild cousins lived in obscurity. As the pioneers swarmed this country, dubbing Utah “The Beehive State” and opening newspapers with names like The Sacramento Bee, 3,000 to 4,000 species of wild bees buzzed the landscape, largely unnoticed. Native bees do not typically share the desire of the honeybee to live in a small space with 10,000 members of the family. They do not produce honey to keep their colony fed through the winter. These bees have different habits, some of them so singular that they make scientists laugh out loud with puzzlement. The female of one species likes to burrow nine feet under a sand dune to lay a single egg. Another chews away at sandstone walls to make its tiny nest. Yet another hangs on the stalks of dead plants at night, alone and balled up, resembling a berry. Some develop fabulous coloration — one orchid bee is metallic gold with a blue abdomen and a red and gold thorax. And they pollinate plants, often better than European honeybees. The natives’ pollinating abilities are attracting more attention because the honeybee on which most American agriculture depends has run into a series of problems: It started mating with aggressive Africanized bees that swept over the border from Mexico in 1990, rendering its children often impossible to work with. It is vulnerable to parasitic mites and fungi, weakened by insecticides and disease. In the past several months, headline after headline has announced a dramatic drop in honeybee populations due to a mysterious malady called Colony Collapse Disorder. Wild bees don’t mate with Africanized bees, nor do they suffer from the same diseases and mites that afflict honeybees. 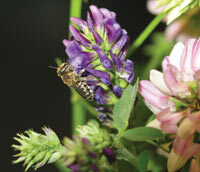 There has never been a better time to develop wild bee pollination talent for use in American agriculture. The bee lab in Logan — one of five federal research labs devoted to bee research, and the only one that doesn’t deal in honeybees — is doing just that.